A general geometric phase singularity array structure is presented and discussed. For any two-dimensional point lattice, a singularity array is defined as a summation of helical phase singularities with alternating handedness. The phase angle is the slow-axis orientation of a varying half-waveplate. Arrays are demonstrated in photoaligned polymer liquid crystal films. 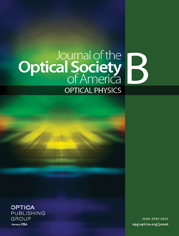 Simple square and biomimetic spiral lattices are characterized for diffraction behavior. Pattern selection rules based on topological charge are discovered. Numerical decomposition shows that diffracted beams are composites of a few ordered planewaves for square phase arrays and Bessel beams for spiral phase arrays. Orbital angular momentum spectra of spiral diffraction are directly measured. » Visualization 1 Square DW of Q = 8, a = 320 μm, viewed between crossed polarizers. » Visualization 2 GA-spiral DW viewed between crossed polarizers. » Visualization 3 Recording laser beam for Q = 1 square DW pattern.